Started his first studies under his grandfather, a violinist, and then continued his studies for nine years at the conservatories "E.R.Duni" in Matera and "U.Giordano" in Foggia. After his experience as an orchestra violinist in the symphonic and operatic scenes, he started to dedicate himself more deeply to a personal instrumental research which brought him, in the early 80's to play with local musicians and for a brief time with Antonio Infantino, in the contest of derivative traditional music from Basilicata. In 1986 and 1987, he performed as a gypsy violinist in numerous shows for the Darix Togni Circus. From 1988 to 1994 he studied at Seminars presented by Siena Jazz and taking part in ensemble groups with B.Tommaso, P. Fresu, G.Trovesi, E.Rava. and the "Orchestra Laboratorio" directed by B.Tommaso. From 1992 to 1995 he became first solo violinist for the Utopia Orchestra (in Zetema/Matera) directed by B.Tommaso and once again together with B.Tommaso, in 1996 and 1997 joined the group Il Diritto e Il Rovescio. In 2000, he created the Rino Adamo Quartet with Loïc Dequidt on the piano, Massimo De Stephanis as double bassist, Fréderic Delestré on the drums and produced "Nebedoti " (Le Carrozze Records) his first record in his own name. His quartet was invited in 2001, to the Italian Jazz Siena Jazz Festival. In 2002, together with the pianist Sergio Corbini, he produced "Antologia Italiana" (Le Carrozze Records). In 2004, he recorded and distributed "Variazioni su un Tema" (Splasch - Contemporary) with the Rino Adamo Fiii Quartet (Loïc Dequidt at the piano, Mauro Gargano as double bassist and Fabio Accardi on the drums). 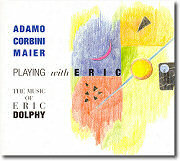 In 2005, he distributed "Playing with Eric – the music of Eric Dolphy" (Splasch - Contemporary) with Sergio Corbini and double bassist Giovanni Maier. In 2006, in collaboration with AJMI of Avignon and Siena Jazz/ The National Academy of Jazz (for its 30 year anniversary), created the project "Euro Jazz Lab" with Sergio Corbini, Samuel Silvant and others musicians. 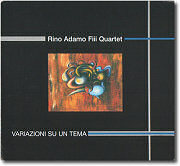 After a series of concerts in France and Italy, with this quintet he recorded a cd which has not yet been distributed. In 2008, he collaborated with Professor Riccardo Putti from the Literature department to produce the theatrical piece "Grisou", inspired by the work of Luciano Bianciardi, presenting original music and performing live at the Auditorium of Santa Chiara at the University of Siena. In 2014, taking a new direction in electronic experimentation, he founded, together with the trumpeter, Mariano Di Nunzio and the saxophonist/clarinetist Sandro Marra, the Trio "Almost Modern 3" distributing the record with the same name (Mardin Records). This record was awarded in 2015 by the magazines "Musica Jazz" and "JazzIt". Continuing his musical experimentation, in 2015 he participated in the project "Quasimodo" with Claudio Riggio (Guitar/Electronics), Alessandro Giachero (Fender Rhodes/Synth), Filippo Manni (Theremin/Electronics), Giuseppe Sardina (Drums/Percussion). With this group, in 2016 he publishes "Episteme of a Dream" with Filibusta Records. In the same year and under the same label he publishes his first completely solo record: "Electric Life Suite - 14 Violin Solos" the result of several years of research on the live electronics. Since the '80s, Rino, accompanies his musical activities as a music teacher in State middle schools. Continuing his experimental journey, in 2017 he records with the singer Boris Svoldelli, and the cd entitled "Convergenze" is published in 2018 by the Onyx Jazz Club. In the same year it is published by Slam Productions " Endless Work " in Trio with Stefano Franceschini (Saxes / Clarinet / Electronics) and Sergio Corbini (Piano / Synthesizer). "NUX ERAT " (Bruno Tommaso, Vittorino Curci, featuring Pino Minafra, Evan Parker, Gianluigi Trovesi & Orchestra Utopia) / CMC 1993. 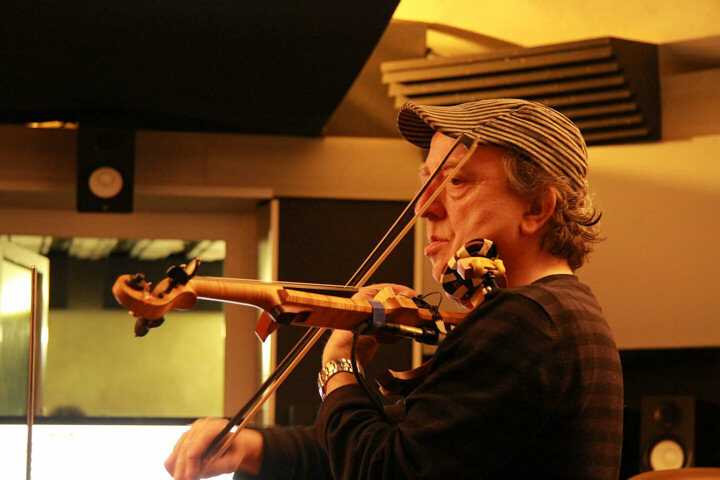 The composer and violinist has proved to be one of the most original, eccentric, peripheral "new" voices of Italian Jazz. After the notable Antologia Italiana recorded in duet with the pianist Sergio Corbini, Adamo reunites a symbiotic quartet with Loic Dequidt (piano), Mauro Gargano (double bass), and Fabio Accardi (drums). Nine original compositions play in complicity mainly with the pianist, hovering on the sonorous edge between contemporary music and experimental Jazz. In the violin solo in Anima tripla, Adamo can be appreciated in the quartet of the enigmatic Prologo, and in the sharp Lillo e la mosca, in the refined Canone imperfetto. Music restless and passionate.